Wow, this summer has literally flown by. It seems like school just let out, and here we are already preparing to start up again in a few short weeks! One of our family's favorite summer activities is sports. Not necessarily organized sports, but because we have a rather big family (6 children plus Mom and Dad makes 8), we are able to enjoy many sports with just our family. Of course, there are always friends to get involved too! Some of our favorites are volleyball, racquetball, basketball, and recently tetherball. My personal favorite sport though, is Tae Kwon Do; and while it's not your typical outdoor team sport, it is definitely a sport that requires you to stay fit and hydrated. So, when given the opportunity to customize an item from CustomSportsProducts.com, I knew one of their Aluminum Water Bottle would be perfect-not just for TKD, but for all our sports as well. The customizing process is very easy to use, and allows for a great range of personalization. 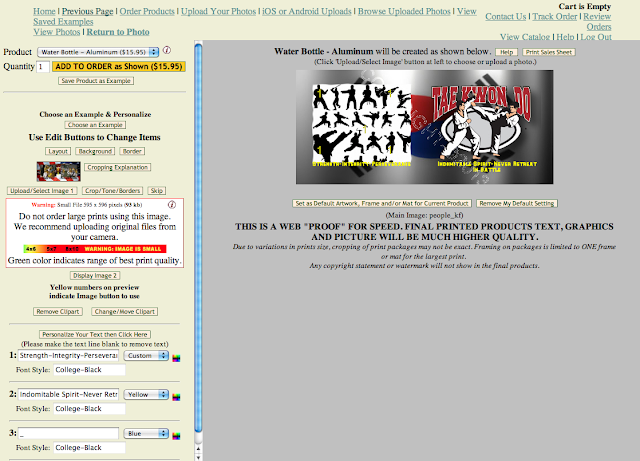 You can choose an example, which is basically a template with 1, 2, or more pictures and text. 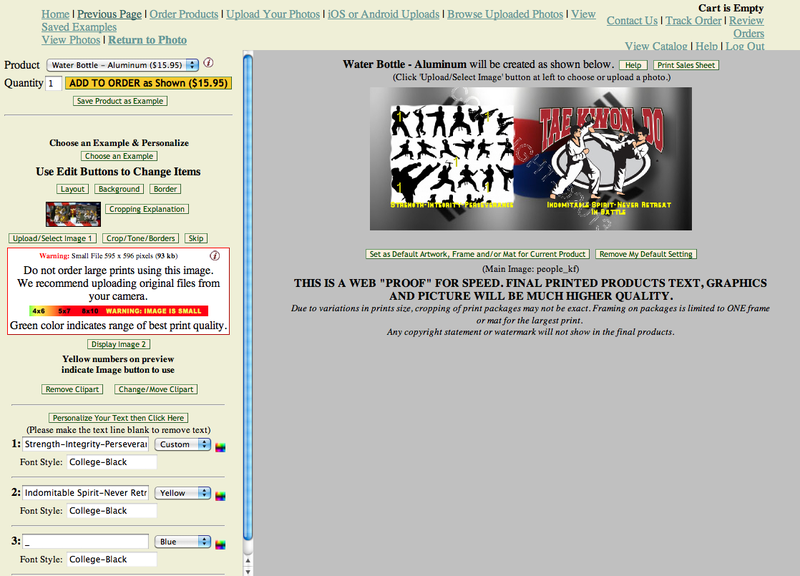 You can upload your own photos, use the provided clip art, or a combination of both. I had a lot of fun designing my water bottle, and enjoyed all the options available. Here's a screenshot of my "proof", so you can see a little of how the design tools work. Once the order was placed, it didn't take long to receive my water bottle. When it arrived, I was immediately impressed. First of all, the aluminum means this bottle won't get cracked or ruined the way a plastic bottle would. It's very sturdy, and very lightweight. One of my favorite aspects of this bottle, is that it comes with 2 lids. The standard lid (with a carabiner attached) that screws on and off, and also my favorite topper, a sports-bottle-style pop-up lid, with an attached cover. This makes it so much easier to grab some water while participating in sports, instead of needing to unscrew and screw a cap on and off. However, the other cap does come in handy to clip on my belt during walks, hikes and bike rides. I love having both options! Of course, the best part about this water bottle is obviously the custom aspect. My TKD design turned out perfectly-I could not be happier with it! The colors are bright and bold, and the text came out great. Sometimes when you custom design something online, it's hard to tell if the text will be legible on the actual product, but this came out exactly as it looked online. 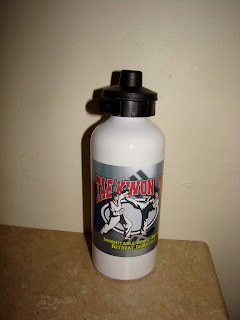 I am so pleased with my new custom water bottle, and I will certainly be recommending CustomSportsProducts.com to any friends who ask about it, or anyone who is looking for custom products! CustomSportsProducts.com has so much more than just water bottles; t-shirts, bobbleheads, magnets, puzzles, sports balls and stadium cushions are just a few of the items they offer for customization! Check them out today! While you're there, you can use this special code (gb52bc55d275bc685) to get a $5.00 discount when you purchase a water bottle. 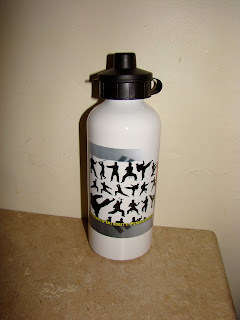 Also be sure to visit CustomSportsProducts Facebook page, where they're running a giveaway for a custom water bottle! I am always on the look out for decent water bottles. I do like the aluminum bottles better then the plastic ones.